Samia Halaby is recognized as a pioneer of contemporary abstraction in the Arab world. With her work being collected by international institutions worldwide since the 1970’s, this remarkable Palestinian artist, scholar and art historian, has been Influenced by the Soviet avant-garde. She works with the conviction that abstraction is based in reality, and has not been properly explored. Born in Jerusalem in 1936, Halaby and her family fled Palestine during the war in 1948 and sought refuge in Lebanon. In 1951, her family relocated to the US, settling in Cincinnati, Ohio. Receiving her education in the US, her career took off in the 60’s. Becoming well respected in American academia, Samia started teaching throughout universities across the USA. As I see it, Palestine need not be in my painting and should not be in my painting. If Arab art and Palestine is in some paintings, that’s because it’s part of my past and will come through as part of my experiences in the real world. But if I’m a painter, I should be a painter trying to do paintings that are the most advanced possible. Over the past fifty years, Halaby has built up historical abstractions in painting, such as that of the Russian Constructivists, merging this with traditional Arabic arts and Islamic architecture. Abstraction is not about the artist or his or her individualism, but rather about the far more difficult and thus more satisfying ambition to invent a visual language capable of containing exchangeable knowledge. Of course, the uniqueness of painting is that this shared knowledge is a visual one. Halaby primarily works in abstraction but has also applied a documentary-style of figurative drawing in more politically oriented works, namely her ‘Kafr Qasm Drawings’, an ongoing series that began in 1999 after interviewing survivors and relatives of the victims of the 1956 massacre that occurred in the Palestinian village of Kafr Qasem. Also publishing her landmark text ‘Liberation Art of Palestine: Palestinian Painting and Sculpture in the Second Half of the 20th Century‘ in 2002. She has designed dozens of political posters and banners for various anti-war causes and is featured in the publication ‘The Design of Dissent‘. Halaby comments on her activism for Palestine, “I’m very much an activist for Palestine, and I’m a leftist — the two seem to go together. The experience of being evicted from Palestine and losing everything was a very painful one. My father was affluent when we were evicted from Palestine, so I won’t say I suffered hunger or pain or not having a roof over my head, like the refugees, but nevertheless, there’s a lot of emotional stress. There’s a deep pain in every Palestinian about it, I think. Halaby is not just a remarkable artist and influencer, she is also valued in American academia, becoming an associate professor at the renowned Yale School of Art for a decade. Her noteworthy contributions include a groundbreaking undergraduate studio art program that she introduced to art departments throughout the Midwest. 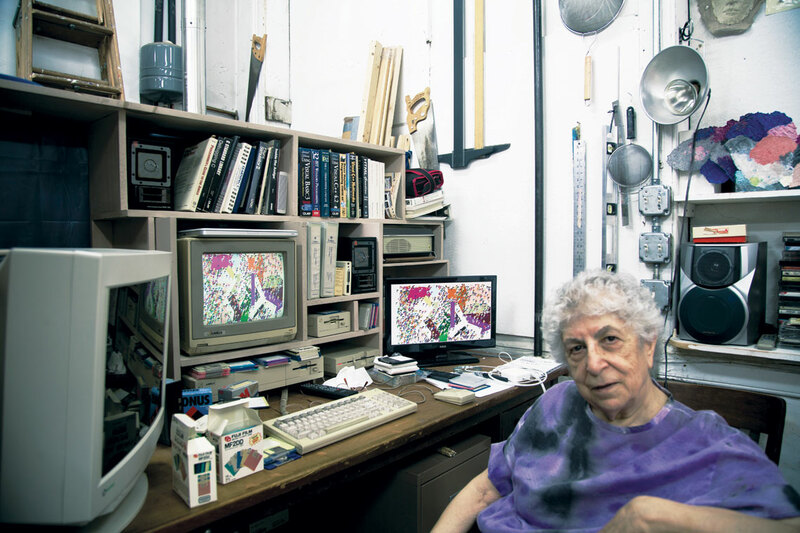 After retiring from lecturing, Halaby began experimenting with electronic art forms, teaching herself how to program Basic and C programming languages on an Amiga computer. Creating user-friendly programs that would allow viewers to witness the process of live computerized painting; she enlisted the help of musicians for kinetic art performances that were inspired by jam sessions. Her “Kinetic Painting Group” toured extensively in the late 1990s. Halaby has held many solo exhibitions and her paintings are held in several museum collections, including the Jordan National Gallery of Fine Arts, The British Museum, the Guggenheim Museum, The Art Institute of Chicago, and The Detroit Institute of Art. In the early 2000s, she was instrumental in the innovative exhibition “Made in Palestine,” which was organized by the Station Museum of Contemporary Art in Houston. Halaby actively assisted the curators in researching Palestinian artists, both in the US and the Arab world. 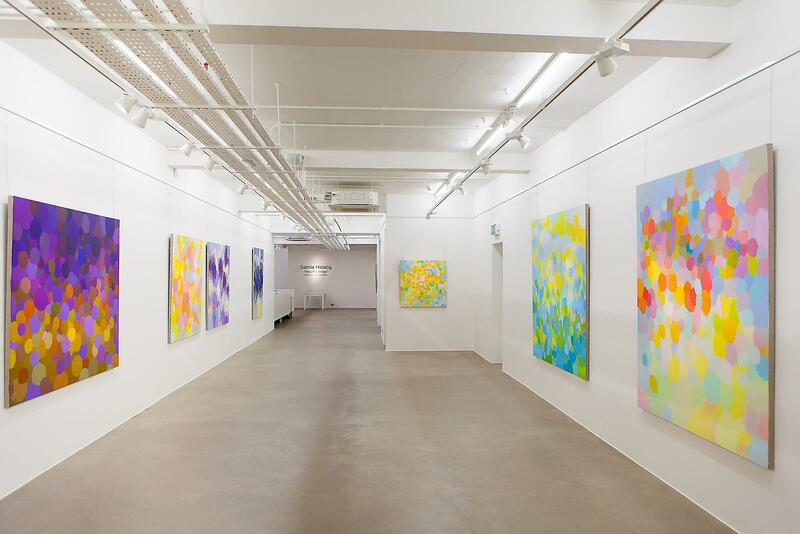 Based in New York since the 1970s, she has long been active in the city’s art scene. In addition to participating in leftist political organizing for various causes, she has long been an advocate of pro-Palestinian struggles.